Even though I (correctly) doubted the Trump Administration’s sincerity, I applauded proposed reductions in foreign aid back in 2017. I very much want to reduce poverty in poor nations, of course, but the evidence is very strong that government handouts don’t do a very good job. Moreover, we also have lots of data showing poor nations can enjoy dramatic improvements in living standards so long as they adopt good policy. Hong Kong, Singapore, Chile, and Botswana are very good examples. Yet some people haven’t learned this lesson. Consider the current debate over Trump’s threat to end aid to Central America if illegal immigration isn’t reduced. A column in Fortune makes the case that handouts to Central America are necessary to reduce human smuggling. President Donald Trump ordered the State Department to cut funding for Guatemala, Honduras, and El Salvador this weekend in retaliation for the recent influx of migrants from these nations, reversing a longstanding policy that says aid helps abate immigration. …According to Liz Schrayer, president and CEO of the U.S. Global Leadership Coalition—a nonprofit coalition of businesses and NGOs dedicated to American development and diplomacy—pulling back aid “exasperates the exact root causes that are creating the migration numbers’ increase.” …“It will only result in more children and families being forced to make the dangerous journey north to the U.S.-Mexico border,” said the five Democratic lawmakers in a statement. A piece in the New York Times makes the same argument. The Trump administration’s decision to cut off aid to El Salvador, Guatemala and Honduras to punish their governments for failing to curb migration is a rash response to a real policy dilemma. …it will exacerbate migration from the region without twisting Central American politicians’ arms. …The decision to cut off aid is bound to drive up migration numbers. 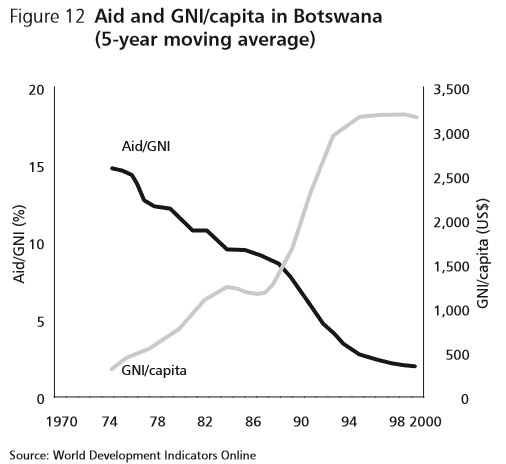 Ironically, the author admits that aid is ineffective. …we shouldn’t pretend that the aid itself was doing much good… it is mostly distributed inefficiently in large blocks by foreign contractors. Though he seems to share the naive (and presumably self-interested) arguments of international bureaucrats about the potential efficacy of aid. Central American governments and elites have gotten away with abdicating their fiduciary, social and legal responsibilities to their citizens. They have failed to collect tax revenue and to invest in social programs and job creation that alleviate the plight of their poor. 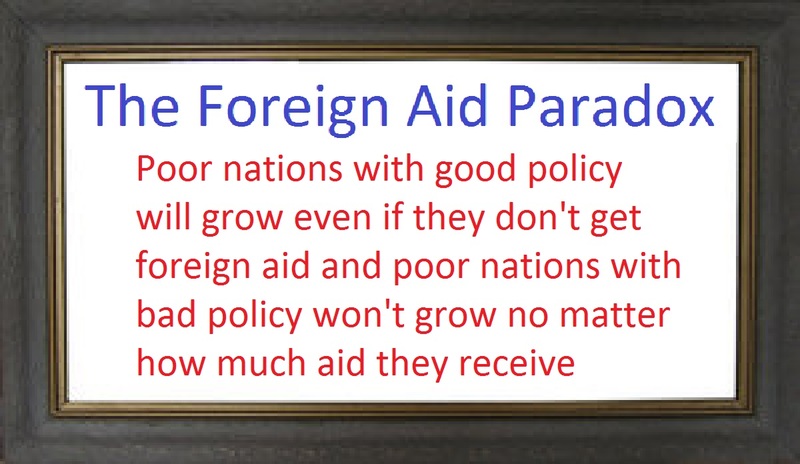 Even some small-government conservatives seem to think that more aid would make recipient nations more prosperous and thus reduce illegal immigration. What President Trump is doing now — cutting aid — is wrong. …As former White House Chief of Staff and SOUTHCOM Commander, General John Kelly, has noted, “If we can improve the conditions, the lot in life of Hondurans, Guatemalans, Central Americans, we can do an awful lot to protect the southwest border.” …We risk undermining our longterm national interests by cutting foreign aid. We should, instead, spend it wisely in those countries to ensure stable governments that view us as allies and work with them to root out crime, corruption, and cartels. The present policy to cut foreign aid cuts off our national nose to spite our face. This is not an impossible prescription. But it’s also the triumph of hope over experience. In the real world, we have mountains of evidence that foreign aid weakens recipient economies by subsidizing corruption and larger burdens of government. Let’s look at some analysis on this issue. In a piece published by CapX, Matt Warner recommends less redistribution rather than more. …the poor know how to get themselves out of poverty. They just need more opportunity to do it. The question we must ask ourselves is: to what degree are our current development aid strategies aligned with this insight? …If the intervention itself is part of the problem, what can outsiders really do to help? Today there are at least 481 research and advocacy organisations in 92 countries pushing reform agendas to provide more economic opportunity and prosperity for all. The “Doing Business” report provides a blueprint for change. Local reform organisations, supported by private philanthropy, provide the leadership to achieve it and the world’s poor will show us their own paths to prosperity if we will all just learn to get out of their way. Writing for Barron’s, Paul Theroux notes that Africa regressed when it was showered with aid. Brad Lips of the Atlas Network explains why aid often is counterproductive. The international community has donated more than $1.8 trillion to poor countries since 2000 – but this development aid hasn’t lifted many people out of poverty. Arguably, it has made some recipient nations poorer. …the aid has bred corruption, fostered dependence and impeded reforms that deliver sustainable economic growth. …Between 1970 and 2000 – a period in which aid to Africa skyrocketed – annual gross domestic product growth per capita on the continent fell from about 2 percent to zero growth, according to a study by an economist at New York University. A column in the U.K.-based Times is very blunt about what all this means. …the international development secretary should have abolished her department as soon as she was appointed to it… We kid ourselves that this aid works, to salve our consciences about being better off. But as we know, the money benefits charities, quangos, bureaucrats, tyrants and the predatory elite, and all these years later your average African is no better off. Let’s close by looking at a thorough 2005 study from the International Policy Network. Authored by Fredrik Erixon, it documents the failure of foreign aid. …the ‘gap theory’…assumes that poor countries are trapped in a vicious cycle of poverty because they are unable to save and hence have insufficient capital to invest in growth-promoting, productivity-enhancing activities. But there simply is no evidence that this savings/investment ‘gap’ exists in practice. As a result, aid has failed to ‘fill the gap’. Instead, it has, over the past fifty years, largely been counterproductive: it has crowded out private sector investments, undermined democracy, and enabled despots to continue with oppressive policies, perpetuating poverty. …The reason countries are poor is…because they lack the institutions of the free society: property rights, the rule of law, free markets, and limited government. 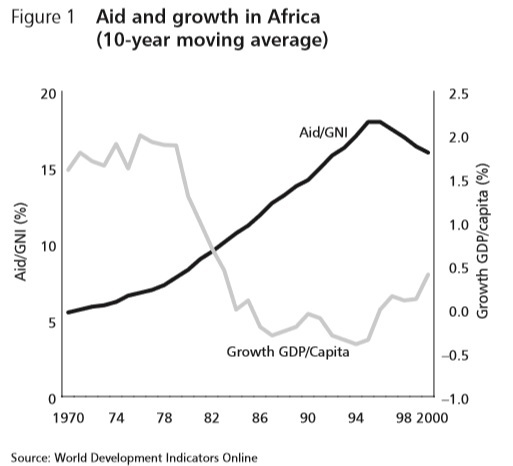 … many studies point to the fact that government consumption in SubSaharan Africa has increased when aid has increased. Here’s the evidence showing has more development assistance is associated with weaker economic performance. By the way, the International Monetary Fund deserves unrestrained scorn for recommending higher tax burdens on Africans, thus making economic growth even harder to achieve. Now let’s look at how two Asian regions have enjoyed growth as aid lessened. Last but not least, here’s some very encouraging data from Africa. I already mentioned that Botswana is an exception to the rule. As you can see, that nation’s success is definitely not the result of more handouts. The bottom line is that President Trump is right, even if his motives are misguided. Foreign aid is not the recipe for prosperity in Central America. I periodically will make use of “most depressing” in the title of a column when sharing bad news. And new data from the Census Bureau definitely qualifies as bad news. It confirms what I’ve written about how the Washington region has become the richest part of America. But the D.C. area didn’t become wealthy by producing value. Instead, it’s rolling in money because of overpaid bureaucrats, fat-cat lobbyists, sleazy politicians, beltway-bandit contractors, and other grifters who have figured out how to hitch a ride on the federal gravy train. Anyhow, here’s a tweet with the bad news (at least if you’re a serf elsewhere in America who is paying taxes to keep Washington fat and happy). Most of my friends who work for the federal government privately will admit that they are very fortunate. But when I run into someone who denies that bureaucrats get above-market compensation, I simply share this data from the Labor Department. That usually shuts them up. By the way, there’s strong evidence from the European Central Bank that overpaid bureaucrats have a negative impact on macroeconomic performance. And the World Bank has produced a study showing how bureaucrats manipulate the political process. …public sector workers are not just simply implementers of policies designed by the politicians in charge of supervising them — so called agents and principals, respectively. Public sector workers can have the power to influence whether politicians are elected, thereby influencing whether policies to improve service delivery are adopted and how they are implemented, if at all. This has implications for the quality of public services: if the main purpose of the relationship between politicians and public servants is not to deliver quality public services, but rather to share rents accruing from public office, then service delivery outcomes are likely to be poor. Here’s my video explaining how bureaucrats are overpaid. It was filmed in 2010, so many of the numbers are now out-dated, but the arguments are just as strong today as they were back then. But keep in mind that the bureaucracy is only one piece of the puzzle. The D.C. metropolitan region is unjustly rich because of everyone else who has figured out how to divert taxpayer money into their pockets. That includes disgusting examples of Democrat sleaze and Republican sleaze. Simply stated, Washington is riddled with rampant corruption as insiders get rich at our expense. No wonder many of them object to my license plate! P.S. Here’s some data comparing the size and cost of bureaucracy in various nations. I’m at the Capetown Airport, about to leave South Africa, so this is an opportune time to share some thoughts on what I learned in the past seven days. 1. Land Seizures – The number-one issue in the country is a plan by the government to impose Zimbabwe-style land confiscation. I already wrote about that issue, so I’ll cite today an editorial from the Wall Street Journal. South Africa needs another enlightened leader like Nelson Mandela, but it keeps electing imitations of Robert Mugabe. President Cyril Ramaphosa confirmed recently that his government plans to expropriate private property without compensation, following the examples of Zimbabwe and Venezuela. …Supporters of expropriation claim black South Africans own less than 2% of rural land, and less than 7% of urban land… But the government’s 2017 land audit used questionable data… The Institute of Race Relations estimates black South Africans control 30% to 50% of the country’s land. …Mandela insisted that land reform is best achieved through a “willing buyer, willing seller” principle, as it is in other democracies with a strong rule of law. …snatching private property is about as destructive a policy as there is. The ANC was founded as a revolutionary party, and the tragedy is that it won’t let the revolution end. To be sure, whites generally got the land illegitimately in the first place (something settlers also did to the Indians in America), so it’s not as if they are the angels in this conflict. I’m simply saying that copying Zimbabwe-style policies would be catastrophically destructive to South Africa’s economy. Rich landowners obviously will be hurt, but poor black will be the biggest victims when the already-shaky economy goes under. It’s unclear at this stage how far the government will push this policy. But since the nation already has suffered the biggest year-over-year decline in the International Property Rights Index, any additional steps in the wrong direction would be most unfortunate. By the way, the news of property rights isn’t all bad. Here’s a video showing how poor people are getting titles to their homes. 2. Mandela’s Legacy – I remarked on my Facebook page that Nelson Mandela should be viewed as a great leader. I was one of many people who thought South Africa would descend into civil war between the races. Mandela deserves an immense amount of credit (along with unsung heroes in the South African community of classical liberals, such as Leon Louw of the Free Market Foundation) for ensuring the nation enjoyed a peaceful transition. Did Mandela have some misguided views? Of course. He was a socialist, at least nominally. And he joined the South African Communist Party at one point. But so what? Thomas Jefferson and George Washington were slaveowners, yet we recognize that they played key roles in the founding of America. Simply stated, people can do great things yet still be imperfect. 3. Race – Notwithstanding South Africa’s peaceful transition from apartheid to democracy, the nation faces some major race-related challenges. Simply stated, blacks are relatively poor and whites are relatively rich. And that’s what leads some politicians to pursue bad policy, such as class-warfare taxation and the aforementioned land confiscation. To make matters even more complicated, there is also a significant – and very wealthy – Indian minority. Indeed, they are the ones who have benefited most from the end of apartheid, which has aroused some racial resentment. Last but not least, there is also a significant mixed-race community that is culturally separate from native blacks (they speak Afrikaans, for instance). 4. Dependency – I wrote about this problem in 2014 and my visit has led me to conclude that I understated the problem. Simply stated, South Africa is not at the stage of development where it can afford a welfare state. Western nations didn’t travel down that path until the 1930s, after they already reached a certain level of development and could afford to hamstring their economies. 5. Labor law – Similarly, South Africa also has European-style labor protection laws, which discourage job creation. Such policies reduce employment in developed nations, but they cripple employment in developing nations. 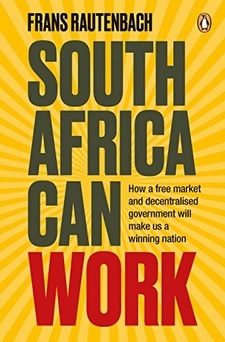 By the way, if you want a great understanding of South Africa’s economic challenges, you should buy South Africa Can Work by Frans Rautenbach. 6. Corruption – In addition to the anti-market policies described above, South Africa also has a pervasive problem with political sleaze. Simply stated, politicians have been using government as a means of looting the public. Here are some excerpts from a report in the New York Times. …city officials drove across the black township’s dirt roads in a pickup truck, summoning residents to the town hall. …the visiting political boss, Mosebenzi Joseph Zwane, sold them on his latest deal: a government-backed dairy farm… The dairy farm turned out to be a classic South African fraud, prosecutors say: Millions of dollars from state coffers, meant to uplift the poor, vanished in a web of bank accounts controlled by politically connected companies and individuals. …In the generation since apartheid ended in 1994, tens of billions of dollars in public funds — intended to develop the economy and improve the lives of black South Africans — have been siphoned off by leaders of the A.N.C. …Corruption has enriched A.N.C. leaders and their business allies… that is just a small measure of the corruption that has whittled away at virtually every institution in the country, including schools, public housing, the police, the power utility, South African Airways and state enterprises overseeing everything from rail service to the defense industry. Shrink the size and scope of the state and much of that problem automatically disappears. Here’s another excerpt, which is noteworthy since it overlooks the fact that the government created laws requiring black shareholders and directors. Needless to say, that system wound up enriching politically connected blacks rather than ordinary citizens. A smattering of influential figures, like the current president, Mr. Ramaphosa, amassed extraordinary wealth. They were allowed to buy shares of white-owned companies on extremely generous terms and invited to sit on corporate boards. They acted as conduits between the governing party and the white-dominated business world. Some of the A.N.C. leaders who were left out of that bonanza quickly found a new road to wealth: lucrative government contracts. The public tap became a legitimate source of wealth for the well connected, but also a wellspring of corruption and political patronage, much as it had been for the white minority during apartheid. 7. Crime – The biggest quality-of-life problem in South Africa is crime. The homes of successful people are often mini-fortresses, with big spiked walls topped by electrified wires. Large aggressive dogs and private security patrols also are ubiquitous. Sadly, the government doesn’t do a good job of policing, yet it also makes it difficult to legally own firearms. 8. Education – To be blunt, government schools in South Africa generally are a disaster. Reminds me of the mess in India, except there isn’t a similar network of private schools to give parents better options. Much of the problem is the result of schools being run for the benefit of unionized teachers (sound familiar?) rather than students. There is some movement in the Cape province to allow charter schools, so hopefully that reform effort will bear fruit. 9. Concluding thoughts – I’ll close with a couple of random non-policy observations. First, South Africa still has some quasi-independent tribal kingdoms. Not exactly the Swiss model of federalism, but it’s better than nothing. Second, it is possible to have multiple wives (I thought of Oscar Wilde’s famous saying when I heard that). Third, everybody should visit South Africa for the scenery and wildlife. I spent a day at Kruger National Park and it was breathtaking even though I barely scratched the surface (by the way, Frans also wrote a great book about the Park). P.S. Here’s my comparison of Botswana, South Africa, and Zimbabwe. Botswana is the obvious success story of the three. P.P.S. The IMF predictably is pushing anti-growth policy on sub-Saharan Africa. I don’t like it when poor people receive handouts from government, though not because I think they’re being grifters. I mostly view them as victims who are vulnerable to getting trapped in the quicksand of government dependency. The people I despise are the rich people who manipulate the levers of power to get undeserved goodies. These well-heeled sleazeballs generally have the brains and ability to earn money honestly, but they decide it’s more lucrative to steal money from ordinary people, using government as the middleman. That’s the moral argument for separation of business and state. But there’s also an economic argument against government cronyism. There’s a very interesting new study from the World Bank that estimates the impact of government favoritism in Ukraine. Here’s how the authors define the problem. Rent seeking is the manipulation of public institutions to obtain…income…without the creation of new wealth. …Rent seeking is sometimes legal. …In Ukraine, rent seeking includes the award of public resources to companies through tax exemptions, direct subsidies and procurement contracts to connected companies that cannot be justified in terms of the economic benefits to society as a whole. The rent seeking activities provide a basis for the existence of so-called “crony capitalism” ….Crony capitalism allows politically connected businesses to enjoy benefits that other companies cannot access. It allows politically connected businesses to create barriers to entry in those sectors where they operate. As a result, crony capitalism allocates resources inefficiently, restricts competition, increases economic costs and limits economic opportunity. …This paper estimates the economic cost of crony capitalism in Ukraine. They start with the challenge of trying to measure cronyism. If we are to assess the impact of crony capitalism in Ukraine, we must first define political connection and distinguish politically-connected firms from non-connected firms. …We use two approaches to identify politically connected firms. The first approach is based on publicly available information on the ownership and control of businesses by politically exposed persons. …A PEP is a person who has been entrusted with prominent public functions, including senior politicians and party officials, senior government, judicial or military officials, and senior executives of state-owned corporations. …The second approach is…to include companies that are not formally controlled by PEPs, but enjoy a political connection through an oligarch or a business group they belong to. …Between half a percent and 2 percent of the total number of firms in Ukraine are politically connected. However, politically connected firms controlled over 20 percent of the total turnover of all Ukrainian companies. Here are some of their empirical results. The economic performance of politically-connected firms in Ukraine is significantly different from that of their non-connected peers. …Politically-connected firms are larger than their non-connected peers. …Politically-connected firms pay a lower effective tax rate. …Politically-connected firms are less productive. Politically-connected firms have a negative Total Factor Productivity (TFP) gap compared to non-connected firms. …This indicates that there could be a potentially large pay-off from policies that promote competition. …Politically-connected firms grow slower than non-connected firms. …Such firms tend to have better access to rents and less incentives to compete. …The politically-connected firms reap the benefits from preferential treatment when interacting with the state and limiting market competition. The bottom line, as illustrated by this chart, is that cronyism promotes and protects inefficiency. And when an economy is less productive, that results in lower incomes and diminished living standards. Sadly, this isn’t just a problem in developing and transition nations. Cronyism exists wherever governments have a lot of power, and that includes the United States. The federal government has myriad policies that tilt the playing field in favor of connected companies. The purpose of policies such as ethanol handouts, the Export-Import Bank, protectionism, tax favoritism, bailouts, subsidies, and green energy is to provide unearned wealth to the friends of politicians. Here’s a recent example of how Obamacare is a vehicle for cronyism, as explained by the Wall Street Journal. Big business feasts on big government, and ObamaCare has been a bonanza for companies that have figured out how to exploit it. …Ohio contracts with five managed-care organizations (MCOs) to administer Medicaid benefits, four of which outsource their drug benefits management to CVS Caremark… CVS appears to be billing the state for far more than what it is paying pharmacies, driving up taxpayer costs. …CVS is also attempting to drive independent pharmacists out of business and expand its retail market share. …Ohio’s Medicaid enrollment has swelled by more than half to 21.4% of the state population, driven in large part by ObamaCare’s expansion to people earning up to 133% of the poverty line. …In the last three years, Ohio has lost 164 independent pharmacies while CVS has added 68. …States ostensibly have an incentive to curb their Medicaid spending… Yet many may be turning a blind eye because they can pass on the bills to the federal government, which picks up 63% of the costs for Ohio’s pre-ObamaCare population and 94% for the expansion population. But cronyism isn’t just enabled by bad policies from Washington. State governments also are guilty of favoritism, even when the feds aren’t involved. Consider the oleaginous handouts for Foxconn in Wisconsin. …the Foxconn deal is a condemnable example of corporate welfare in its most egregious form. …Wisconsin could end up delivering $3 billion in tax credits to Foxconn. …If the jobs target of 13,000 is met, Wisconsin taxpayers will pay $219,000 per job. 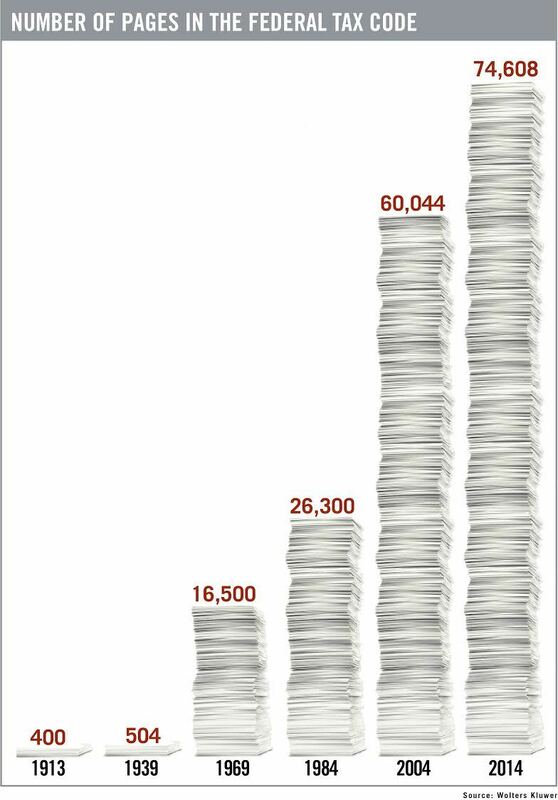 If only 3,000 jobs are created, they will pay $587,000 per job in the form of a $1.7 billion tax credit. …Who wins? The politicians. Who loses? 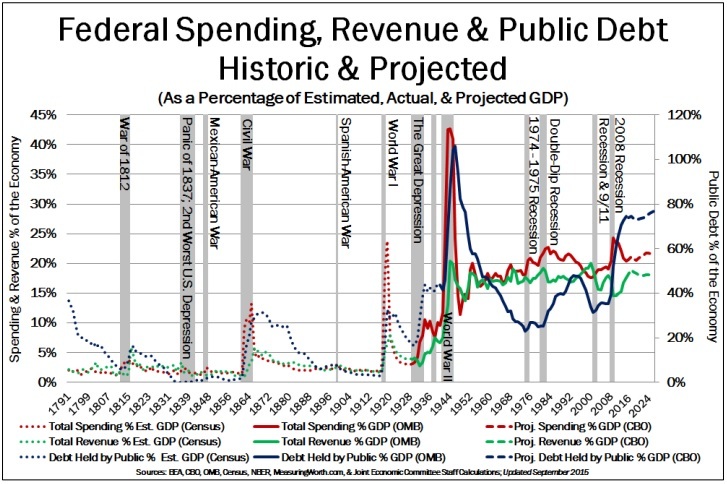 Fiscal sanity and those footing the bill for political pet projects. And the goodies for Foxconn are just the tip of the iceberg. States and cities dole out billions of dollars every year to attract businesses through cash grants, tax breaks, and new infrastructure. …The search for Amazon’s second headquarters (HQ2), for instance, has left around 230 state and local governments genuflecting before the altar of the Seattle-based tech deity, offering tributes amounting, in several cases, to billions of dollars. …The cost of these kind of incentives is astoundingly high — there is little research that points to their success. As I’ve previously argued, the pro-growth way for governments to compete is having low tax rates for everyone. …the most effective solution is the simplest. New Hampshire is a dark horse candidate to receive HQ2, and its pitch is entirely reasonable: Low tax rates for every business, across the board. That approach removes the incentive to attract businesses through what amounts to legal, nonsensical bribery. 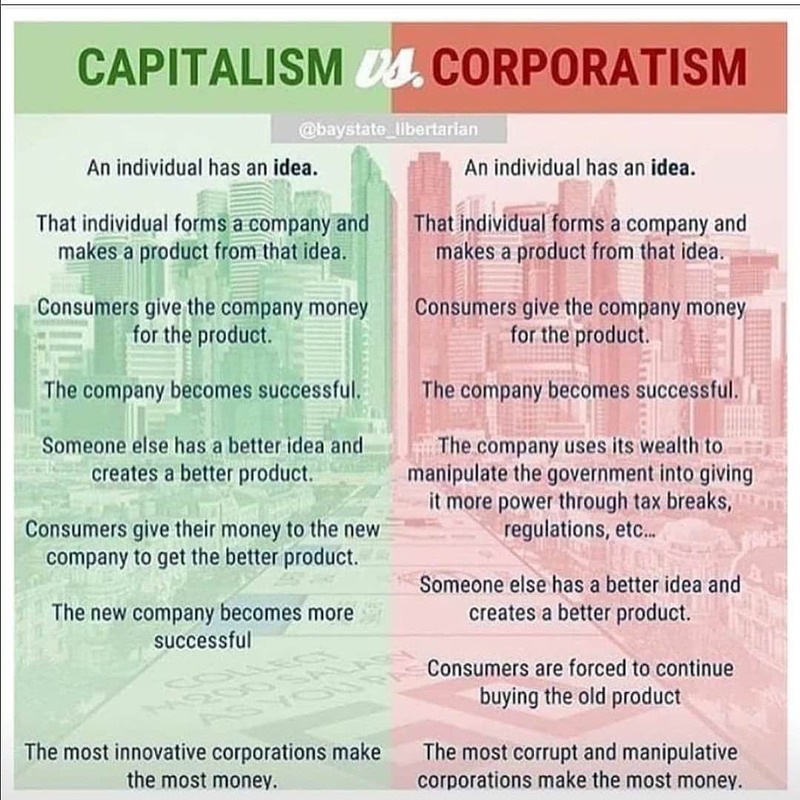 Let’s close with this visual from libertarian Reddit. It’s simple, but a very accurate summary of how the real world operates. P.S. Elizabeth Warren wants to turn all big companies into cronyist entities. P.P.S. American taxpayers are subsidizing cronyism in Ukraine. Lawmakers didn’t necessarily want to block imports. This was before America was plagued by an income tax and some source of revenue was needed to finance the government. And since the central government back then was very small, as the Founders envisioned, the first tariff was only 5 percent and it applied equally to all imports. Compared to what we have today, that was a pretty good system. But it seems inevitable that politicians – sooner or later – will manipulate and abuse any power they have. It didn’t take long for that original tariff of just 5 percent to climb higher. And it also was just a matter of time before politicians begin imposing special tariffs on selected imports in response to pleading (and goodies) from various interest groups. Today, government’s power over trade enables some utterly disgusting and oleaginous examples of insider dealing and rank corruption. For instance, the Wall Street Journal is reporting about an odious example of unjust enrichment thanks to protectionism. …tariffs on imports of newsprint…have been cause for celebration at private-equity firm One Rock Capital Partners LLC. Government records show that a team from the New York-based firm approached the Commerce Department, including one meeting with Secretary Wilbur Ross, saying Canadian newsprint imports were hurting One Rock’s investment in North Pacific Paper Co., a paper mill also known as Norpac. Commerce responded to One Rock’s appeal by setting tariffs on Canadian imports, causing newsprint prices to jump by as much as 30%, significantly lifting Norpac’s business prospects. Some bigwigs bought a paper mill and then used their connections to undermine competition from Canadian paper mills. They get rich, but only by manipulating the levers of power, not because they provide value to consumers. The obvious takeaway from this story is that protectionism is bad for the U.S. economy. Yes, a few rich insiders pocket some undeserved profits and there will be a few more workers at one plant, but those results will be easily offset by the loss of jobs and income elsewhere in the economy because of the adverse impact on newspapers, advertising, and related sectors. But I want to highlight another negative effect. I wrote back in 2011 that there are many well-meaning folks on the left that support class-warfare policies because they assume that rich people got their money illegitimately. Well, this story is sad confirmation that this is often true. I tell all my statist friends that punitive and destructive taxation is not the right response to this kind of sleaze. Instead, we need to get rid of protectionism (and subsidies, cronyism, and other forms of special favoritism). Make sure we have a system where people instead get rich by satisfying the needs and wants of consumers. And I tell my Republican friends that if they don’t want crazies like Bernie Sanders, Elizabeth Warren, and Alexandria Ocasio-Cortez to wind up in charge of Washington, they need to stop playing footsie with special interests and instead fight for genuine free markets. Sadly, neither group is taking my advice.